Information courtesy of International Ice Swimming Association. 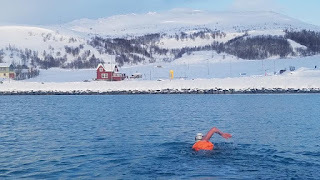 Photos courtesy of Ger Kennedy, Mikkelvik Brygge (located at 70° 3' 12.312'' N 19° 1' 55.2396'' E) at the Norway Ice Swimming Expedition in northern Norway. The Ice Sevens is the ice swimming equivalent of the Oceans Seven. The challenge is only for the most hardened and committed of the ice swimming community. 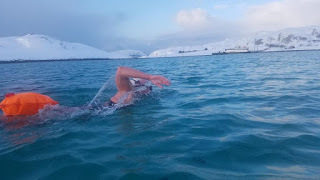 To achieve the Ice Sevens, a swimmer must complete an ice mile under standard ice swimming rules (i.e., no wetsuit, no neoprene hat, independently confirmed water temperatures) in the locations listed below. All the swims must be ratified by the International Ice Swimming Association in order to be recognized. For more information from the International Ice Swimming Association, visit here.